The Anti-Sale Virus Infects Unknowingly! handed out by their companies, sales managers and sales trainers? Even more importantly, when a salesperson is left alone they’ll catch this ‘anti-sales virus’ all by themselves, and even help spread it to other salespeople. This ‘anti-sales virus’ is the reason people don’t like, trust or believe salespeople today. The good news is it can be cured, and must be if you want to increase your sales, achieve and build a thriving career in sales. It must also be managed daily buy sales leaders, business owners and executive if they want their businesses to grow and prosper. Before we get to the cure you need to know that when sales are weak, or economic conditions get tough, the strength of the ‘anti-sales virus’ increases, more is handed out and it spreads rapidly though most companies? I have found most salespeople think, “Not me, I couldn’t be infected with this virus”. This virus has been growing for decades and if it isn’t treated with the ‘antidote’ it eventually makes salespeople very average. In fact, it makes them all look, sound and act the same. What if I told you the ‘antidote’ has been around for years and really works? Wouldn’t you be the first in line saying, “Sign me up” and “Where do I get more?” The cynical salesperson wants to know how much it costs. What if I told you it’s free and the supply is unlimited? Well, guess what, it’s real, you can take it all the time and it will not only increase your sales immediately but help you grow a large healthy customer base. Remember, the supply of the ‘antidote’ is unlimited and free! However, even when you know what it is and how to use it, you’ll have to take it every day and you’ll have to keep taking it every time you engage someone in a sales conversation. In short, the ‘antidote’ is simple to use but wears off easily because other people will be trying to give you the ‘anti-sales virus’. This usually happens unknowingly and if you aren’t careful it’s easy to catch this virus! By now, I know you’re ready for the active ingredient…The ingredient that causes the ‘antidote’ to attract and the ‘virus’ to repel is a salespersons’ intention when engaging people in a sales conversation. Before a salesperson opens their mouth to speak, their intentions are felt (like the scent of a potion) by the people that are attempting to sell. People then decide unknowingly, preconscious, to connect or avoid the salesperson. 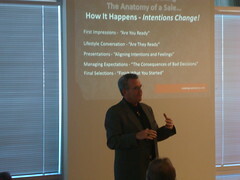 The salesperson’s intentions create their demeanor, presence and attitudes and cannot be faked. What people feel, and salespeople communicate, are the genuine intentions of the salesperson. ‘Trying to make a sale’ is the active ingredient in the ‘anti sales virus’. The ‘virus’ even sabotages skilled salespeople who believe in their product and company, care about the consumer, but unknowingly are infected! Even they will repel people more often than they attract them. You can’t hide the virus from people…it is always showing! The best example of the effects of the ‘anti sales virus’, or intention to make a sale, can be witnessed in a new home sales office when watching the interaction between consumers and salespeople. If there is a salesperson and a temp in the sales office and a consumer comes in, they will most often engage the temp and avoid speaking to the salesperson. I’ve personally witnessed this and over the years had many new home salespeople confirm this behavior by consumers. It’s amazingly interesting that people are attracted by the ‘antidote’ the temp has taken or repelled by the ‘virus’ the salesperson is infected with. People will engage the person that is not infected with the ‘virus’ from the intention ‘to sell them something’. Most companies, sales managers and sales trainers want salespeople to say the right things to create a better conversation with consumers. They want and teach salespeople to ask better questions and be better listeners. The problem is, when salespeople try to do this, while infected with the ‘anti sales virus’, consumers won’t engage them and the engagement or conversation stalls. As long as a salesperson is infected with the ‘virus’, sales will continue to be difficult and the relationship between consumers and salespeople will grow more dysfunctional. In short, people will keep avoiding salespeople until they become extinct. The active ingredient in the ‘antidote’ is found in the intentions to help, serve and do what’s best for the consumer. The intention to make customers, not sales, is the missing ingredient. In fact, the intention to sell is the spoiled version of the intention to make a customer. The ‘virus’ wasn’t and never has been anyone conscious intention. It just mutated over the years from paying to much attention to the desired results companies, sales managers, salespeople and sales trainers wanted to create, instead of paying attention to what would create the results. Too much concern over what we want and not enough concern over what customers want. It’s also obvious that in a difficult economy we spend more time worrying and obsessing over the numbers and less time concerned about the customers concerns so the effects of the ‘virus’ worsen and spread. 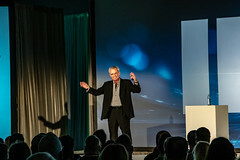 When the ‘antidote’ is taken, the missing link in the sales conversation happens…a connection between the salesperson and the consumer. This connection causes or allows a conversation or real dialogue to take place so a healthy relationship can begin. This is the power of the ‘sales attraction potion’; it makes the consumer/salesperson connection happen and allows the other ingredients in the ‘sales potion’ to be used to best serve the consumer. The steps of a sale, which have been taught for many years in various forms, only happen when this connection is made. Consumers only engage salespeople who have taken the ‘antidote’. 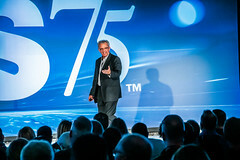 When the connection is made, people are served, customers are made and sales increase while business grows. After taking the ‘antidote’, salespeople are free to enjoy the profession of selling as the noble profession of service it was intended to be. Whether you have taken the ‘antidote’ and whether companies encourage their salespeople to take the ‘antidote’ will determine your sales success! Keep handing out the ‘virus’ and you will keep struggling to make customers and grow your business. In fact your salespeople will look, sound and act so much like your competition all they can be is average at best. The intention to help, serve and do what’s best for the customer is the active ingredient in the ‘antidote’ that attracts customers and increases sales. It is the ingredient that leads to your sales success and needs to be handed out daily! I just started a blog syndication group on Facebook. Want an invitation?